So, for those who did see it and just find it boring, please excuse my repetition. Trying to delineate theGreek elections, I came up with some thoughts concerning the Aries Ingress chart. Aries dispositor, Mars, is a very important factor in Aries ingress charts. This year, Mars falls in Greece�s 6H, the house of its joy.. I accidentally noticed that a 6H Mars was a repeated A.I.C. 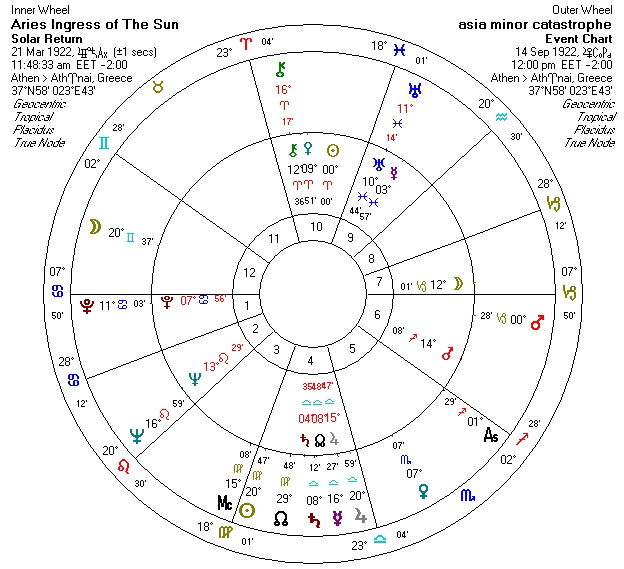 (Aries Ingress Chart) factor in Greece�s recent history dramatic years, all related to military action: 1922 (Asia Minor disaster), 1967(military junta), 1974(Turkish invasion in Cyprus). It also made its appearance in the �softer� junta version of 1936. On the contrary, years 1936, 1960, 1998, 2005 had L1 =dom or exalt or conj benefic. If my previous assumptions have a point, then it�s gonna be another dramatic year with military action involved, joined perhaps to territorial loss. I fear Mars in Libra in July-Aug 2012 could trigger similar dramatic events. Strangely, Cancer Ingress chart has the same ASC & MC degree as the Aries chart. Since the elections take place only a couple of days before Cancer ingress, I think there might be some connection. on the other hand, there is a difference between the other 3 years/events above mentioned: Transit Mercury. Then Tr.Mercury was also cardinal, and tightly aspecting Mars& Saturn, whereas this time, as long as Mars is in Libra, Mercury will be in Leo. So we're hopefully saved by Mercury..
thank you for the compliments james! first of all I have to say I am a total amateur, I have read no books on mundane astrology, I just try to figure out things using this great forum. Maybe that's why i'm more inclined to statistics: lack of actual knowledge. The reason why I decided to work with the ingress charts is precisely this number of charts. Surely, the chart of 24 july 1974 fits perfect Greece's current situation: last elections were referred to as the end of post-metapolitefsi (24 july 1974 to now). But I haven't come to a conclusion yet. Since I'm not using my PC at the moment, I'll come back after having looked if the other rejected A.I.C. have any Saturn close to 0' cardinal as you pointed out. It might also add up to something! Geo I am impressed by your work - even more so because it comes out of an amateur who has never read a single mundane astrology book - as you state! "It is worth mentioning that some astrologers favour a rather recent birthday for Greece (placing the birth of modern Greece in the period following the fall of the Greek military junta in 1974). Some (European mostly) astrologers for example claim that modern Greece's national horoscope should stem out of the date its last Constitution was adopted (on the 11th June 1975 - soon after the collapse of the military dictatorship). But how proper is it to study astrologically a country not using its "foundation" horoscope but what actually is the horoscope of a posterior constitutional "amendment"? If somebody studies the 1st January 1822 Constitution s/he will realize that it is essentially as democratic and advanced as the Constitution of 1975. Thus, on 1975 we did not experience a major constitutional shift in regard to the VERY Greek constitution (the constitution upon which Greece was founded on). We just experienced a shift in regard to the imposed by the military junta regime - a regime that lasted only 7 years, not so many to alter the "soul" of Greece and its original constitution. 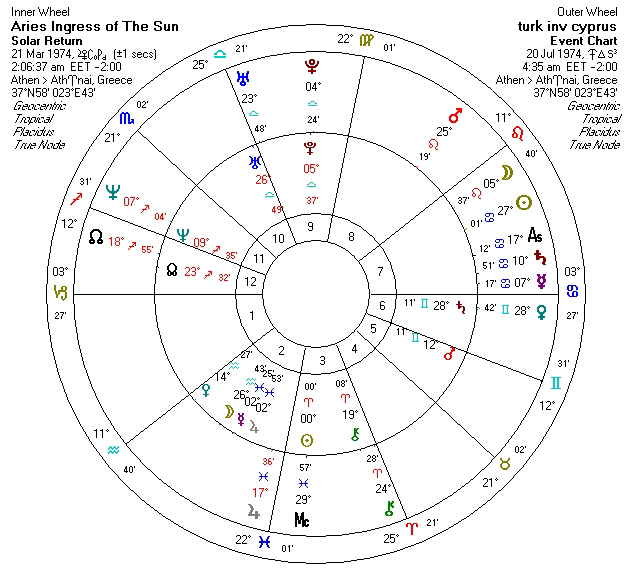 Some other astrologers claim that modern Greece's horoscope should stem out of the moment its first post-dictatorship Prime Minister was sworn in - on the 24th of July 1974. But as I explained before, the seven years military junta did not change either the "soul" or the constitution of Greece. 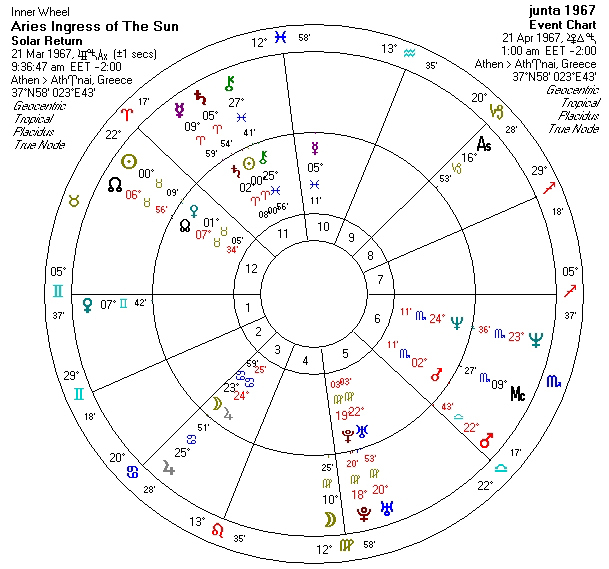 Why should we then consider the July 24, 1974 chart as the "national horoscope" of Greece and not the original January 13, 1822 one? If we follow the same reasoning then we should argue that a person is not born when s/he comes out of his/her mother's uterus but when s/he gets married for the second time! We have to be very careful and thorough when we study the intricacies of a national horoscope. " yes, I've come across your argument about the 1st Constitution date as the birthdate of Greece, when I was trying to find out at the web what the greek astrologers had to say. Although I'm not defending the 24-7-1974 case (the reason is that cardinal signs dominate our recent history long before that date-but so did wars), it's true that Karamanlis arrival marked a new era, in the same way Kapodistrias arrival did 150years before him. It's just that I don't feel the 1st Constitution to be that strong in our greek collective unconcious mind.. I would like to see more thoroughly the case of Kapodistrias arrival maybe. Or maybe, it could be just what Mark suggested in a previous thread about greece http://skyscript.co.uk/forums/viewtopic.php?t=6420&postdays=0&postorder=asc&start=15 , that it's hard to name a birthdate for countries with history dating thousands of years back. Besides, "nation" is only a couple of centuries back invention (17th cent). I think I lean more to that kind of approach, and that was the reason why I started working with the Aries Ingress charts instead. So, from your experience, what's to expect from that nasty 6H Mars? Dear Geo the January 13, 1822 chart is not just the "first Greek constitution" chart but the chart of the Declaration of Independence of the Greeks from the Turks (who had militarily occupied Greece for 4 centuries) and even more the Declaration of the "political existence" of Greece! It is the chart of a highly historical, unparalleled moment! This topic's theme is 6H mars in Aries ingress chart, as occured by some accidental assumptions I made based on Greece's recent history. This way you'll have more chances to discuss it with people that will share the same interest with you. Why else would Greece occupy half of my posts?! I just cannot comment on the national horoscope issue, since I haven't occupied myself with that field -yet- and, besides, you seem -no offense- to already have a fixed opinion on the subject you brought up for discussion, which, in my view, leaves little room for discussion after all.. I don't think I have a fixed opinion. I am open in discussing every aspect on Greece's national horoscope. But how can I discuss that matter with you when 1st) you wrote me above "this is my yard. Please go elsewhere and start your own subject". 2) You declared you are an amateur and you haven't read a single book on mundane astrology? Dear Thomas, I didn't mean to offend you nor compete you. It's just that I have come across your arguments many times in the web -this forum also included-, and all I see is the same argument on how this should be the proper national horoscope and not another etc, without having seen from you what you do with that horoscope. I mean, without having seen actual astrology. If you say "this is the national horoscope I consider for valid -for all the reasons you mentioned- and these are, for example, my delineations for year 2012", I am totally with you and glad to be part of such a conversation. Otherwise, I personally have nothing to discuss further. Georgia I wrote in my previous post that you seem hasty in judging people but now you seem hasty in judging articles too. Have you ever read my article on the national horoscope of Greece in the first place? Because in it I present plenty of arguments, the two most fundamental of them being 1) that the national horoscope I propose is based on the historical Declaration of Independence of the Greeks from the Turks (who had occupied Greece for 4 centuries! ), on the 13th of January 1822 2) that even the Greek Political Scientists argue that modern Greece was "born" on the 13th of January 1822. I have read your article and have studied mundane astrology extensively but I remain unconvinced by your position. That is not say that the 1822 chart you advocate vigourously is not worthy of serious study and consideration. I agree it is. Its clearly a key historical moment in Greek history. My problem with your position is more fundamental than that. I simply dont agree that one chart can sum up a country. I have addressed that point very extensively in the other thread you just opened so I will not repeat all the points I just made against your position here. Of course we are all entitled to our pet theories and charts. I have some of my own too. For example, I think the 1789 constitutional chart for the USA should be looked as seriously as the various 1776 charts. However, its just my view. Rather than seeking the 'one true chart' to rule them all I concur with the ideas of the Irish astrologer Bill Sheeran. He focusses on identifying a 'family' of associated charts for a nation and finding the common themes. In particular Sheeran suggests we need to focus on 'structural coupling', which describes how planetary transits, etc. activate a whole family of historically linked charts at the same time. In my opinion Bill Sheeran's article on national charts ' The Observer Observed' is the most philosophically profound piece ever written on national charts. There is no birth chart for a nation, only charts for significant moments in the unfolding of a nation's political and societal processes. And which of these 'speak' to a particular astrologer says as much about that person's perceptions, contextual understanding and the way they practice the craft as it does about the essence of the craft itself. Anyway, check out my reply on the other thread and why I also think the quest for a 'one true national chart' in the case of a country is an illusionary one.